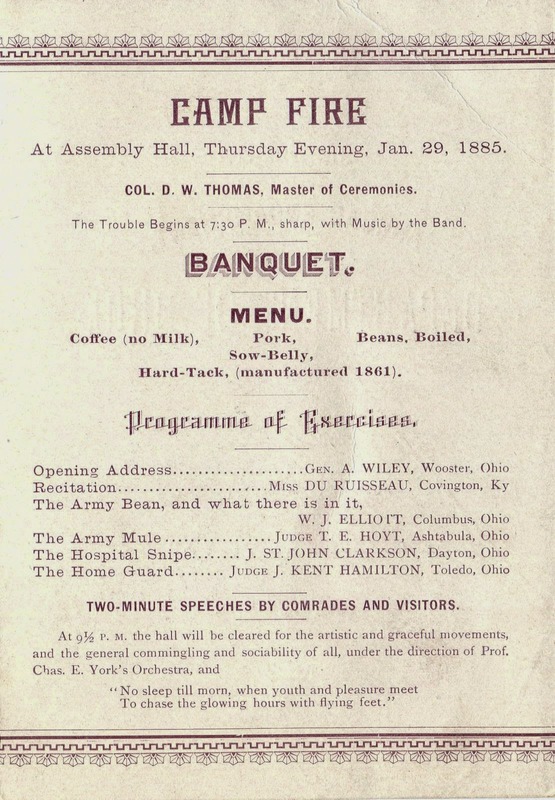 This small souvenir from the three-day event also contains the program of speeches delivered on the night before the banquet. 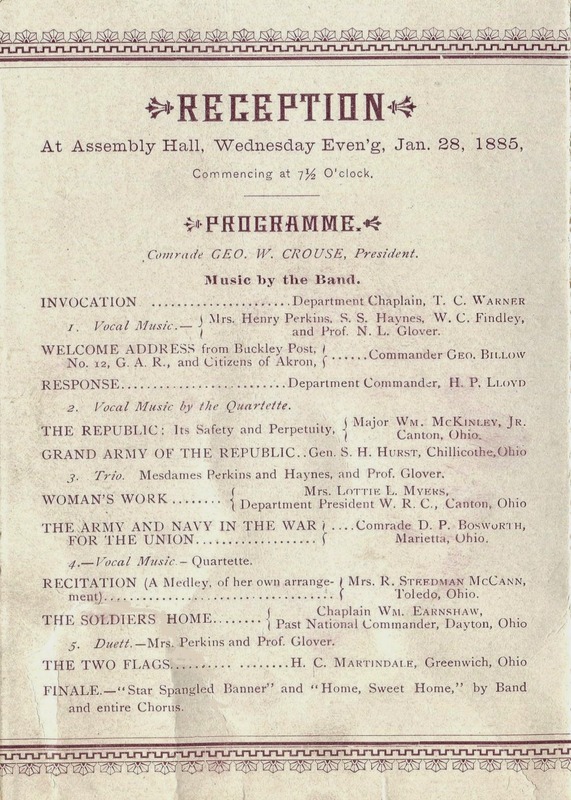 The most prominent speaker was Major William McKinley, Jr. Born in 1843, McKinley joined the 23rd Ohio Volunteer Infantry soon after the Southern states seceded from the Union. 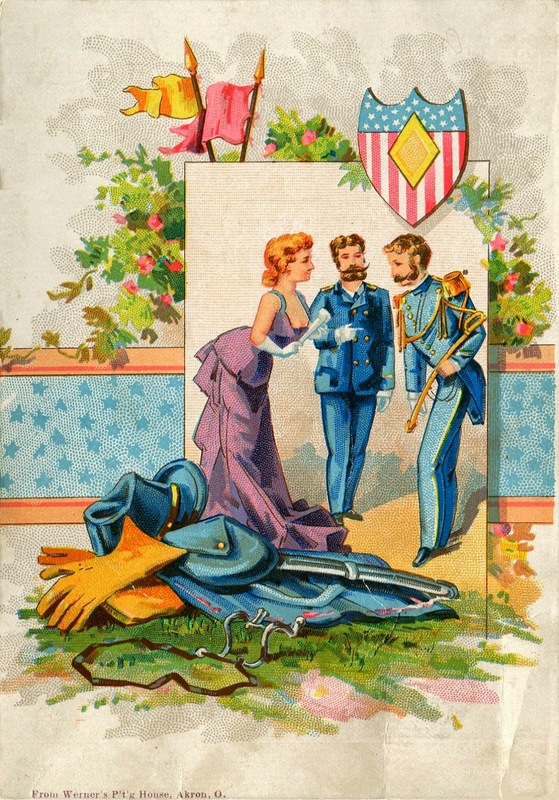 After the war, McKinley embarked on a career in the law and later entered politics. He took his first congressional seat in 1877; was elected the Governor of Ohio in 1891; and eventually became the 25th President of the United States. The menu below features two kinds of pork (sow belly is fat salt pork) and hardtack, a simple flour biscuit. Baked in northern factories, the three-inch-square biscuits were very hard by the time they were delivered to the soldiers in the field. Called by a variety of names like “dog biscuits,” “tooth dullers,” and “sheet-iron crackers,” they were often crumbled into coffee or fried in a skillet with pork in a concoction called “skillygallee.” They were even mixed with brown sugar, hot water, and whiskey to create a pudding. 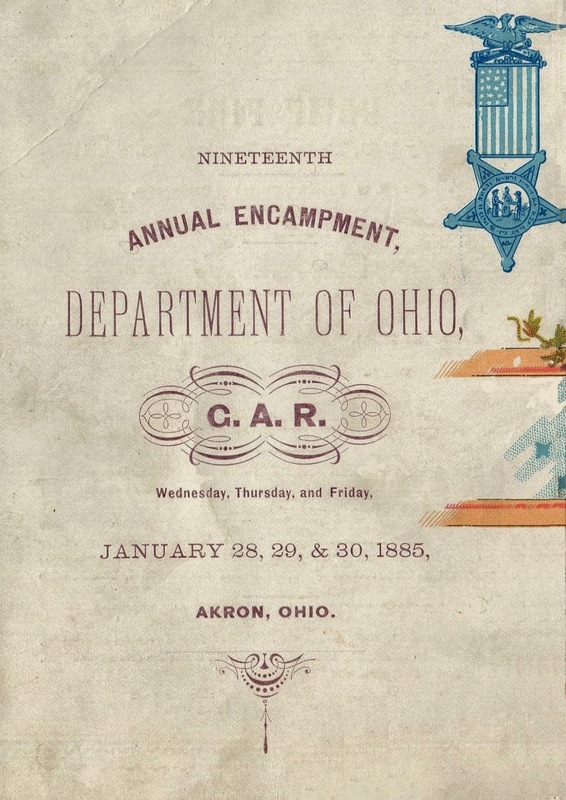 Surprisingly, the menu claims that the hardtack served at this reunion was manufactured in 1861, thereby insuring that it exhibited the proper degree of indestructible rigidity. 1. Jon Grinspan, New York Times, 9 July 2014. That's a very interesting find. I wonder if the hardtack part of the menu wasn't tongue in cheek? I remember reading that in addition to being as hard as a brick, it was often worm-infested.